I'm been concentrating on chore #1 because that's the one I'm most interested in. But I sure can't enjoy the fruits of #1 until #2 is completed and #2 is a bear. Last fall I had a new roof and gutters installed on the house. Then in the spring, we re-landscaped the yard. In July and August I had the foresight to paint the exterior of the house. So at the end of August (and the start of the rain) the house has that street appeal thing going big time. Other important tasks are accomplished like getting the crawl spaced cleaned and re-insulated and having the old underground oil tank decommissioned. Turning now to the interior, the nest is in a constant state of upheaval. Move everything out of one room. Paint that room. Rip up the carpet. Then go on to the next room. This week the painting should be just about wrapped up and we'll be ready for the floor guy to refinish all those scuffed up and newly exposed fir and oak flooring. There is nothing like moving everything you possess to tell you how much stuff you still have crammed into a house. But, we push forward and know that it's got to go somewhere. We hope to have the house on the market before the day of the dead. Having the house on the market will be a minimalist adventure as we fill up some driveway storage PODs and try to live with as little as possible inside the house. After all, the goal is to have perspective buyers come inside and imagine all their stuff there.. not my stuff. Our realtor friend, Peggy Smith with Lake Realty has been so very helpful with suggestions for colors and vendors. If there were only more hours in the day and I had the energy to keep working through them then we'd be on the market sooner. It's like pushing a giant ball up a hill. You just keep the pressure on and take it one step at a time. Getting out of this house will be a huge milestone. Just as getting Traveler purchased and fitted out is a milestone. No house means no yard to maintain and no house payments to make. We'll be happy renters for a while until we can move to the boat. The idea of downsizing is very appealing. After securing Traveler the best we could, with canvass in place and docking lines doubled we grabbed a taxi to the Autobus station and took the ABC bus to Tijuana. There we found that the San Ysidro border was closed! Border closed? How can that be? 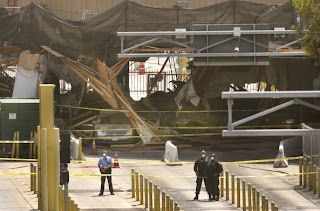 Terrorist plot? Are we at war with Mexico? Maybe a drug cartel his holding the immigration officers hostage. Nope. 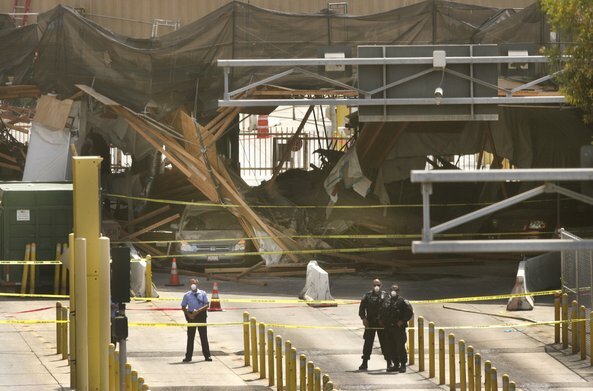 A wooden overhead canopy collapsed onto several vehicles at the crossing, sending 11 people to hospitals and creating a traffic nightmare as thousands of border crossers were diverted to the Otay Mesa Port of Entry. That would be us. In the pandemonium we found an official looking cab driver who took us on a wild ride to the Otay Mesa crossing. $15 each for a 15 minute carnival ride weaving in and out of traffic lanes. We hopped into the dusty queue not knowing that it would take us three hours to get to the revolving gates. Three hours in the hot sun. Three hours without sustenance. Three hours without a pee break. Then to the MTS #905 bus to the Iris Trolley stop. The driver, off her shift, called her supervisor and got permission to take a bus load of stranded riders to the Trolley. We all rode for free, chanting and cheering. By that time Alaska flight 885 had left San Diego without us. Hours later, ensconced in the Vagabond Hotel at Shelter Island, I convinced the Alaska supervisor to cut us a deal on return flights early the next morning to Seattle. Crack of dawn flight home and so tired that I napped away the day, calling in sick to work. I'm miles away from my boat. Monday morning we called the dockmaster Rogelio Gregg on VHF 77 and he walked down to meet us. A little paperwork and we were all set with gate keys and directions to the Centro Integral de Servidios (CIS) to check into the port. After breakfast and a nap we all walked over to CIS and began the check in procedure. The operating hours are 9:00 AM and 2:00 PM. It took us 1.5 hours to complete, this with no lines. The next time I'd leave myself about 2.5 hours just in case there are other boats checking in at the same time. Immigration: All crew got tourist cards. Filled out forms and submitted to Immigration officer. He processed these and sent us across the room to the bank where we paid $262 pesos each. Then we brought our stamped receipt back to Immigration for our cards. Port Captain: Same building, same room. Here I used my Visa card to pay the arrival tax for the boat of $306 pesos. We had to present our tourist cards, crew list, and boat documents. We went outside and made a couple of needed copies of documents. Bank: I took the packed from the Port Captain to the bank and here I paid for a temporary import permit at $49.50 dollars on my Visa. The permit is a very pretty document and sticker that you put in the window of the boat and it allows you to keep the boat in Mexico 10 years. Customs: I went to customs (same place) and listed all the gear on the boat. I then pushed the button and got a green light and we were done. What happens if you get a red light? Possibly someone comes to the boat and does an inspection. Cantina: We had to then report to a cantina for the obligatory fish tacos and cervezas. Marina: Back at the marina Rogelio made copies of my documents and we were done for the day. 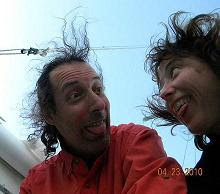 We headed offshore about 5 nautical miles and sailed down the coast with a 10 knot breeze pushing us at about 5 knots. Wonderful sunset at the Coronado Islands then on into the darkness. We swapped one hour watches until 21:00 then switched to two hour watches in teams of two. So Connie and I took the 22:00 to 02:00 shift and Chris and Keith took the graveyard shift from 02:00 to 06:00. 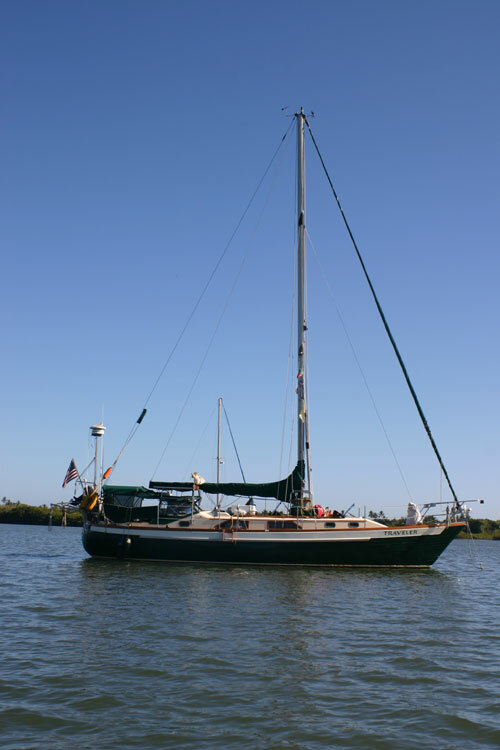 We had to slow the boat down so as not to enter the Bahia Todos Santos til daybreak. Chris had concerns because he could not see both lights on Islas Todos Santos but later found that our chart was old and the newer chart showed one light inactive. 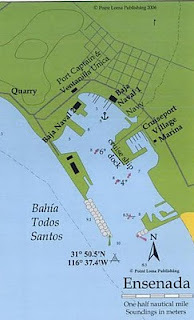 I took my shift at 06:00 and took us into the bay (Bahia) and around the breakwater at Ensenada harbor. 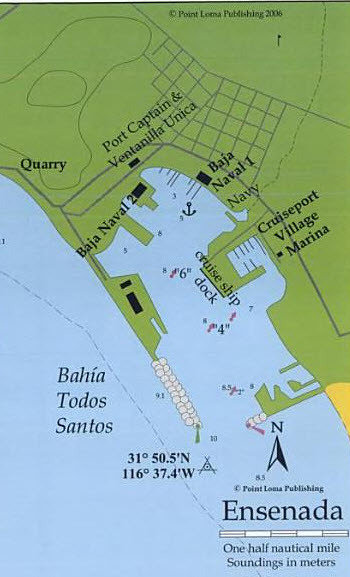 We went straight to the dock without a problem as I had previously identified Baja Naval marina on Google Earth. Lessons learned: Since we'd figured that the trip would take about 14 to 16 hours we decided to travel through the night as to arrive early in the morning to approach the harbor in daylight. In retrospect we could have left Mission Bay early in the morning, say at about 04:00 and got in just at sundown. Then we'd just tie up at the marina and wait till the morning to check in. Thus we'd avoid having our sleep patterns disturbed. Slowly and surely we've progressed towards our intended goal. 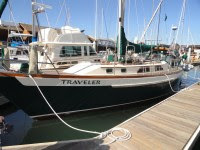 After months of refit and repair we're ready to move the boat down the coast to Ensenada, Baja California Norte, Mexico. Connie and Scott fly in on Friday. Chris and Keith come in on Saturday and we leave Sunday afternoon. Friday, we cleaned the boat and mounted the new stern light ($99.00). 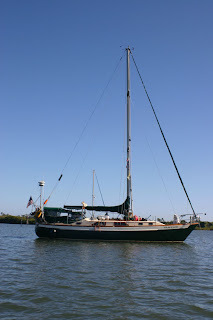 Saturday, with Chris and Keith there hauling on the halyards I ascended the mast to mount a new windex and to check the anchor light/tri-color light.The windex needed at least 4 hands to assemble so I had the deck crew pre-assemble it and send it up in a bucket. I then I fastened it to a mounting bracket on the mast cap. the Tri-color lens was cracked right between the clear anchor lens and the tri-color top lens so I called down for some duct tape to do a temporary fix. With everything stowed on deck and below we went through our off-shore checklist and left the dock on Sunday at about 13:00. 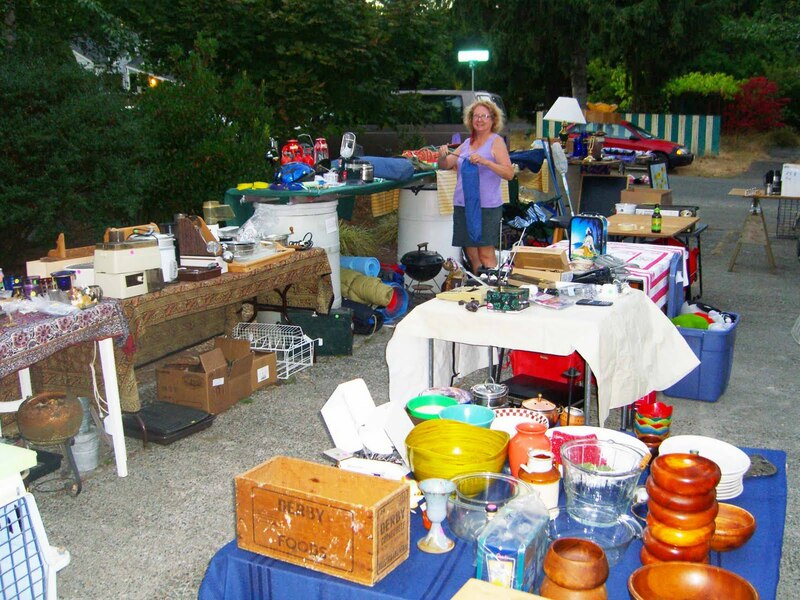 The yard sale went very well last weekend but gosh it was a lot of work. We spent all day Saturday creating lots of display surfaces and then dragging all that crap out of the shed and the house. Considering the fact that neither Scott nor Connie had a clue as to what things sell for at yard sales we decided to bring in an expert. Our friend Lindor came by and set to re-pricing and rearranging. By nightfall we were ready and I wrapped the entire driveway full of sale items in big plastic tarps to protect everything from the dew and thieves. Then Sunday, sans Connie, we started selling... and selling... and selling. As items were sold, Lindor moved things up towards the front, always keeping interesting items close to the street. Lindor approached each customer, gave them the speel and sent them to me with their money. I had to keep going to the house to stash the cash. Monday with about 70% of everything sold still saw lots of traffic as people searched through the worthless stuff to find something, anything they could buy. By the end of the day we were exhausted. Advertise in Craigslist... three separate times, Thursday, Saturday, and Sunday. Had some really good stuff.... Can't take it on the boat now, can we?